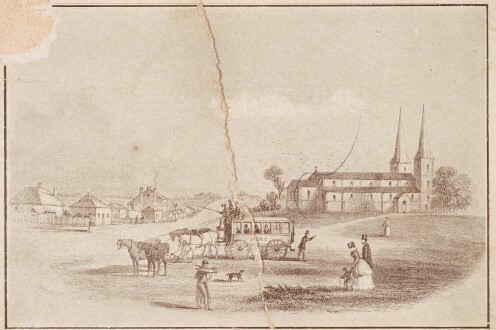 Parramatta Heritage: Old Church Street, Parramatta (Part 3), by James Jervis, Parramatta Historical Society. The section at the south-eastern corner of Church and Phillip Streets was granted to Captain Phillip P. King on June 30, 1823. A substantial cottage stood on this site hence the issue of a grant. On July 31, 1823 this building was advertised as to let. It was then said to be occupied by the Rev Thomas Hassall, son of Rowland Hassall. The property was advertised as for sale in the "Herald" of March 15, 1838, and it was then occupied by Dr. Bute Stewart, a well-known medical man of early Parramatta. The land between Captain King's portion and George Street was … ﻿granted to Richard Rouse on June 30. 1823. Rouse applied for a grant on May 27, 1823, on the ground that the buildings were agreeable to the general unit. Rouse evidently occupied the building, as he was Superintendent of Government Works for many years in the old town. Mr. Rouse leased the house to the Government for use as Courthouse in 1824 and it was used for this purpose for many years. When the building was vacated by the Government, Charles Fairs announced in the "Herald" of March 27, 1839 that he would carry on business in the premises. Adjoining Sherwin's block was a section leased to Charles Whalan. This lay between James Wright's lease, nt the corner of Macquarie Street, and Sherwin's land. John Wylde, lot no. 46, section 18, George Street; Chas. Walker, lot no. 91, section 21, George Street. This was the site on which the Red ... Cow Inn stood.. Wm. Watkins, lot no. 21, section 17, George Street; Andrew Nash. lot no. ? ?, section 20, on which the well-known "Woolpack Inn" had been erected; Jas. Elder, lot no. 18, section 16, George Street; John Ellison, lot no. 47, section 18, George Street; Gcorge Howell, lot no.6GO, section 23, George street; John Jones, lot no. 5, section 13, George Street. Between 1823 and 1830 no further grants appear to hnvc been made but from 1830 the town lands were gradually sold to persons wh0 had, in many cases, purchased from leaseholders the leases issued during Brisbane's regime. The town lands of Parramatta provided much work for the Court of Claims, which was set up to deal with cases arising out of land disputes, and even at this late date, the Parramatta lands provide work for the legal gentlemen.